What started off as a Clinic has now grown over the years to become a world class facility for treatment of all types of spinal issues. I'm working as an Officer in the Kerala Police Dept. Since about 10 years I was suffering from Back pain, for which I had undergone various expert Spinal treatments from Allopathic, Ayurveda & Traditional sectors. But even though each time I got relief from the Back pain, it didn't prolonged much and after some period the same problem returned. While years passed, the intensity of the problem and pain increased and in October 2016, I fell on bed due to unbearable back pain and admitted to hospital. MRI Scan report was quite distressing. One of my Spinal Discs has been damaged and migrated downwards to the bottom area of the lower Vertebrae. By that time I suffered Numbness on my left leg and it's strength started decreasing remarkably. All medical experts advised about a Spine Surgery for removing the erupted Disc, to solve the problem. But going through many of the cases of people who undergone Spine Surgery, it's understood that only about 20% guarantee is there in Spine Surgery and even if it's alright by a surgery, in future all those persons suffered set backs, for which no one has been found recovered further. On further enquiry, many among my friends, colleagues and also some Doctors suggested Dr.B Robin Guru Singh, Gurupatham Spine Care Centre, Karinkal, T.N. 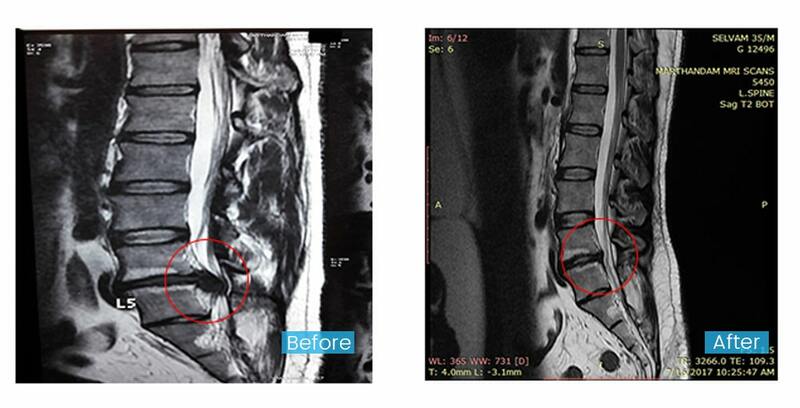 as the best way to get permanent relief from Spinal Problem, without surgery. I heard the real testimonies of many of them, even from those who were completely paralysed on bed, and later achieved tremendous recovery and now found to be persons with "No problem Spine". 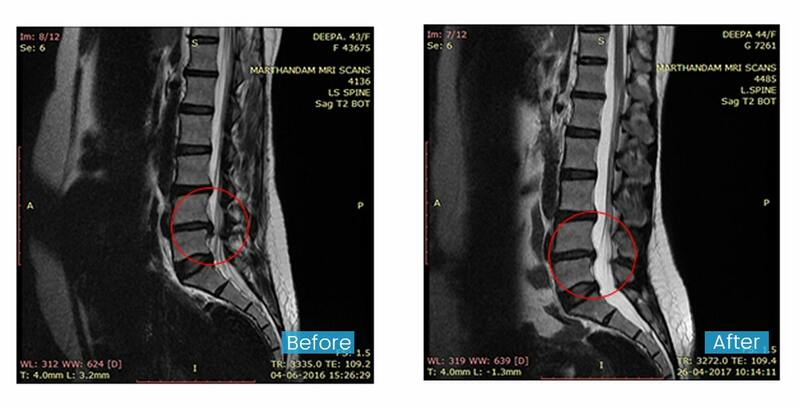 Hence we decided to approach the Gurupatham Spine Care Centre at Karinkal and we've been taken there by one Mr.AlexNalinan, an Architect from Amaravila, Trivandrum, who had undergone treatment at Gurupatham for his severe spinal illness some years back & recovered completely. The therapy treatment for my most complicated Spinal problem begun on 21st November 2016. But now I have to say that it's quite miraculous that while taking MRI Scan after the treatment, the Disc which was migrated downwards to the bottom of the lower Vertebrae has been pulled back up to it's normal position !! The numbness of my left leg has gone and the strength has been recovered completely. It's much surprising for all of us including my previously consulted doctors. Now myself along with my family members Thank God for providing such a wonderful Treatment centre and a well versed Doctor in Spine Care, in South India. I explained this real experience to most of my friends, relatives and colleagues & most of them are now making benefit of this Hospital. All of them are so happy now, as most of them were much disappointed in the past as they were not able to recover from Spinal illness even after many expert Spinal treatments previously. This treatment is purely Scientific based on the MRI Scan report, and the Doctor's approach is transparent too. The treatment expense is very moderate compared to other Treatment Centres/Hospitals. I heart fully suggest all of you to approach this most appropriate Spine Care centre, for your entire Spinal well being. God Bless You. Dear Doctor, I give below the feedback for the treatment given by you to my wife. I , A. Laheer, am residing at Colachel, Kanyakumari Dist, Tamil Nadu. 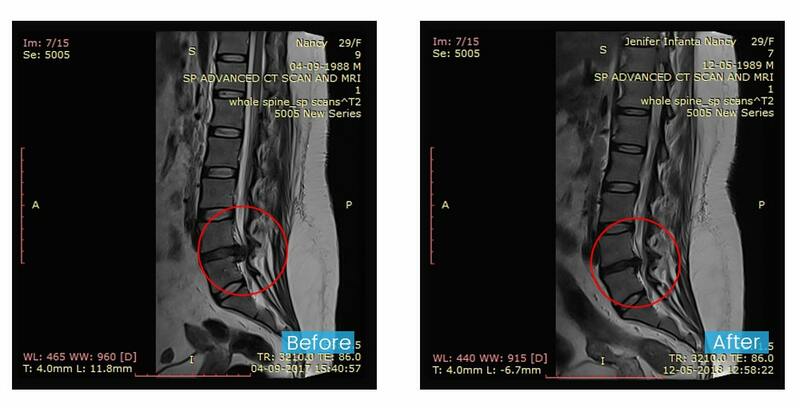 My wife was sudenly affected by severe disc bulge during the month of Feb 2016. She faced very hardship in her day to day activities and she was totally bedridden and unable to move an inch. Immediately she was taken to one of the famous hospitals in Trivandrum and they have suggested to go for surgery. On enquiry with my friends and relatives, I have come to the conclusion that surgery is not at all advisable. Then we went for Ayurvedha treatment and we found no cure. At that time one of my distant relatives told us about the Gurupatham Spine Care Centre at Chellamkonam, Kanyakumari dist. Fortunately it is very near to my native place. Immediately I have taken my wife to Chellamkonam Hospital during the month of Sep 2016 . 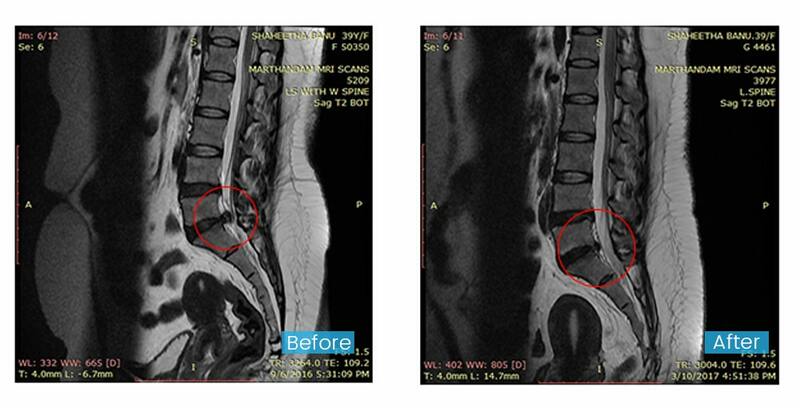 The doctor who is a physiotherapist and manual therapy specialist had explained everything about this disc bulge and prolapse and treatment required for cure in detail and the treatment was immediately started, after taking one MRI scan. The treatment is very simple without any medicine and just by manipulating the bone, the dislocated bone was replaced in the correct place. We are advised to take rest and proper care for minimum period and we follow the DOs and Dont's advised by the doctor very carefully. Then again last week of February, one more MRI scan was taken and comparing the two MRIs, we are very much happy to know the more than 95% of the disc bulge was set right. So this is the correct and opt treatment for disc bulge and prolapse problem. Thanks to the Almighty and the Doctor. I am Jayakumari R. I have been undergoing treatment for my back pain at a famous Hospital in Trivandrum. 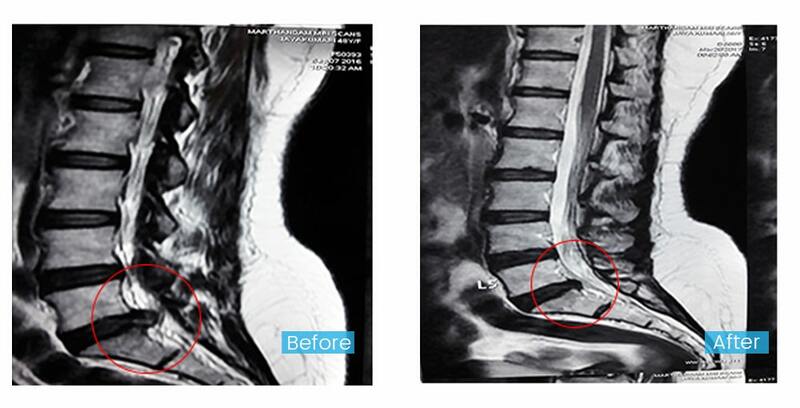 The main doctor diagnosed that there was some curve in my spinal cord which requires a surgery to cure it. I couldn’t even fix my legs on the ground. During that time, I came to know about Gurupatham Spine Care Centre. I went there and started the treatment from August 2016. After the treatment, my MRI Scan report says that 80% of my problem has been completely cured and now I was able to walk normally without any problem. We are living in Chennai, my wife Esakkiammal was suffering from Back pain since 2014, had been trying with various treatment methods like Unani, Varma and Ortho which gave temporary reliefs for about couple of months every time after treatment. In April 2018, it got so severe that she was unable to move out of bed without support and went through severe pain to even put her Left leg on the floor and move for few steps. 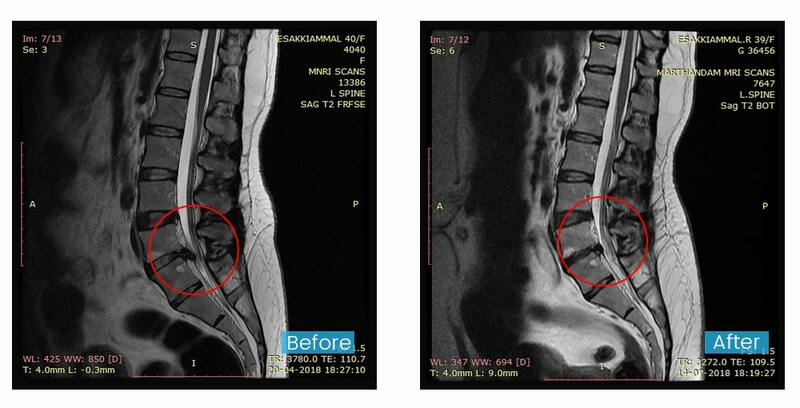 During this time, we had been to Ortho specialist and she was admitted to Hospital, was kept on Pain killers till diagnosed and tried physiotherapy for couple of days with no relief.MRI report showed L4-L5 broad disc protrusion with left nerve root compression. Finally Ortho Specialist advised to go for Surgery, as she was unable to manage pain and no relief. One of our neighbour in Chennai basically from Nagercoil, when visited my wife in Hospital mentioned about your Hospital and treatment method as her uncle had undergone your treatment and got good results. We were in a dilemma, as she had to travel down from Chennai in this condition. Then we decided to send out Scan reports through my brother in law for an opinion with you and possibility of treatment. After review, you also confirmed this is a severe condition and surgery case only, however, you would be able to cure this within 3 weeks of treatment and importance about Post treatment care to be strictly followed. Later, we discussed within our family and decided to come down to your Hospital. The condition at which we had to bring down my wife to your Hospital was very challenging as she can’t even walk couple of steps. Within 2 days of your treatment, my wife started gaining confidence and she was able to walk. We stayed close to 20 days for the treatment in April-May’ 2018, your Hospital was so safe that I could leave my wife with her sister and I could return to my work after a week of admission. She’s totally independent post her treatment and we are very happy and pleased with your treatment and care. We also had our 1st review in August and 2nd review in November just to be sure everything is fine with her and you were also happy with her RESULTS!! We are very thankful to you & your team for such an innovative non-surgical & medicine less treatment even for a severe case with my wife. We would like to appreciate Cordial Staff, Cleanliness, Homely food at your Canteen, Security, CCTV, Wifi, etc.. I personally like to appreciate your Quality consciousness in all Hospital facilities, PASSION, GUTS to build such a nice facility at a REMOTE Location (not even Nagercoil) shows the commitment to your Home place and Confidence in your treatment. Wishing you all the very best to your Hospital and many more Success in the years to come. I have been suffering from back pain for the past 10 years, I had undergone various treatments like Ayurveda, Allopathy etc but everything gave me only a temporary relief. I was working as a driver in Dubai since 10 years and because of this back pain I was forced to discontinue my job. 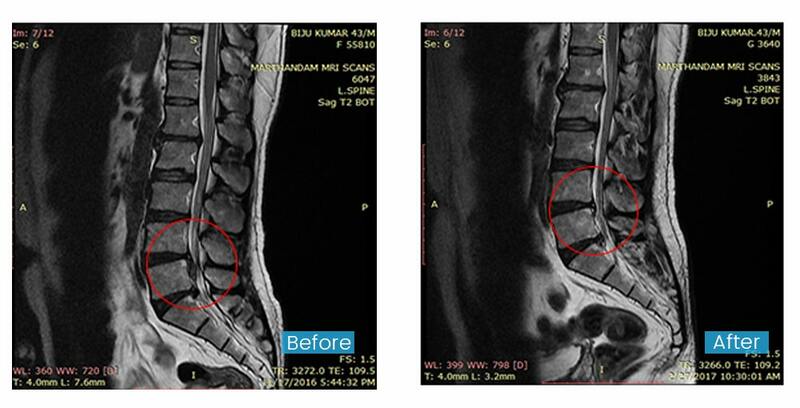 In my MRI report L2-L3 severe disc bulge and many of the leading Doctors in Medical college hospital as well as KIMS Hospital told me that surgery is the only solution. I was severely affected and can’t even walk properly. It was at that time I heard about Gurupatham Spine Care Centre. After 10 days of treatment, Dr.Robin advised me to take 3-6 months bed rest as my case was complicated. But after the course of treatment, I again took MRI report and was really shocked as I am completely cured. The treatment was fully medicine less and no constraints on food intake. Now I am perfectly healthy and started continuing my work. Thanks to Dr.Robin Guru Singh and Gurupatham Spine Care Centre. I am Jenifer Infanta Nancy residing in Chennai. I was suffering from Lower Back pain and sciatica pain for the past 2 yrs. It’s became severe on April 2017, pain was so horrible as the disc bulge was very big in L4-L5 level. Suddenly numbness started in my leg and I was worried about my health. We have consulted many doctors. They suggested surgery is the only solution. At that time, we came to know about Gurupatham Spine Care Centre through our relative, who did treatment in this hospital and recovered. We have decided to consult Dr.Robin Guru Singh. After checking my MRI reports, Dr.Robin suggested me two course of treatments. After First course of treatment done for 8 days, I got some relief. After a month rest, I did second course of treatment. Doctor advised me to take rest for 6 months, because my disc bulge was very severe. Now, I am so happy that, I have recovered completely from disc bulge. My advice to those who are suffering from disc bulge or back pain or any other spinal issues, you can confidently approach this hospital. You need some patience and you should ready to follow the advises given by Doctor . Then you will be free from any kind of spinal pain and you can lead a pain free life. I am sincerely thanking Dr.Robin and his team for this wonderful treatment. I have come with intense pain on my legs and difficulty in walking and sometimes even sitting. After diagnosis with scan results Dr.Robin confirmed that I have bulging of disc which caused serious nerve compression and reduced nerve signals to my legs. I undergone treatment staying in the hospital for one week and some subsequent weekly visits. 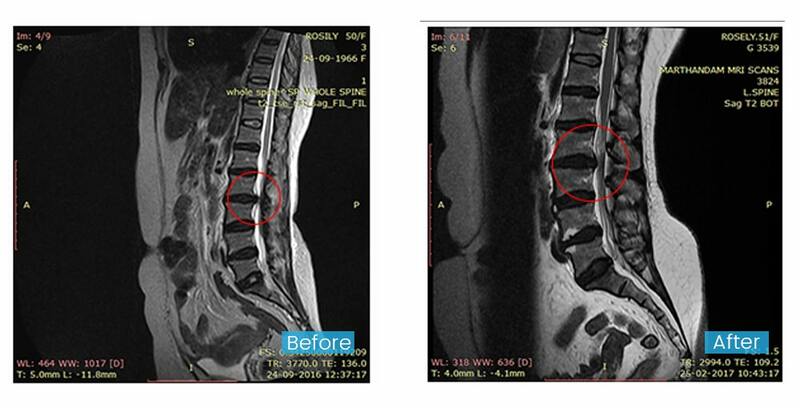 After about 3 to 4 months of treatment, my scan results have shown complete curing of my spine problem. The type of of treatment adopted here saved me from the risk of surgery which is not successful in majority of the similar cases. I can now walk without any pain in my legs. I sincerely thank all the Doctors, especially Dr. Robin, and Other staff in the hospital for availing me the best treatment i could get. I am Mr.George.I am a Guitarist. 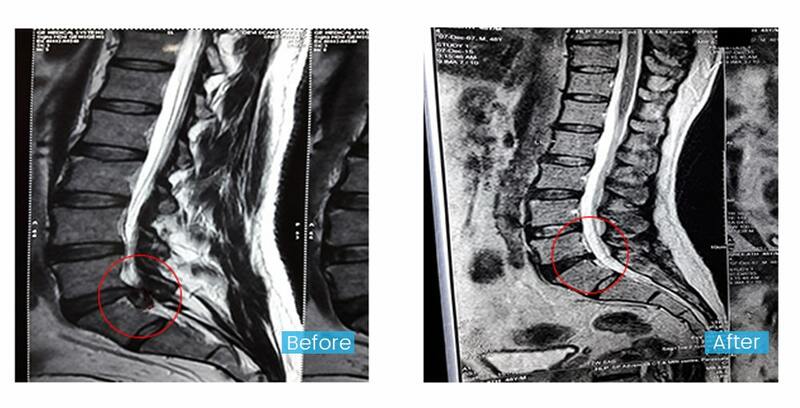 I was suffering from severe disc prolapse in lumbar spine.My leg was totally numb. 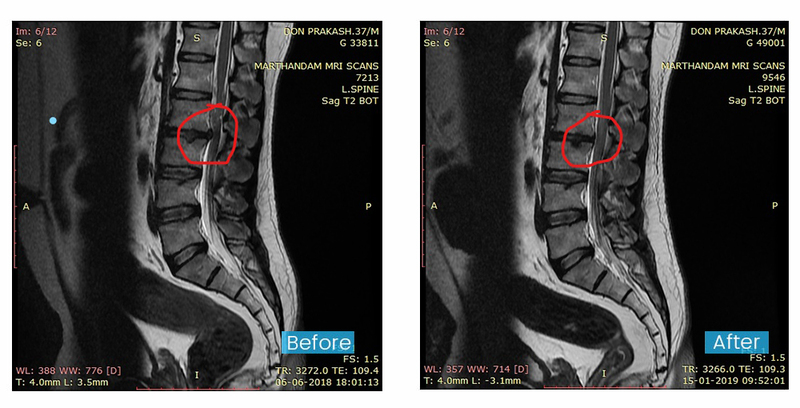 Surgeons suggested immediate surgery.By the Grace of God ,came to know about Gurupatham Spine care Centre.I took one month treatments and complete bed rest for another one month. Now, after taking another MRI,disc bulge completely healed.Now,I am free from my leg pain and numbness. Thank you doctor for making me back to my normal life. Hope you are fine Sir. I am also fine. I just wanted to say thanks to you for curing me from chronic back pain ( disk prolapsed). Before meeting you I was suffering from acute back pain since Mach 2013. I had consulted various doctors which includes Allopathic and Ayurvedic treatment. But i was not comfortable with the treatments suggested by the doctors. I was totally depressed and ultimately the doctors suggested me to do surgery. As a miracle i heard about this centre from one of my train met. After three months, I came back to my normal condition. Your skill, knowledge and positive outlook played a major role in my recovering so well and so quickly. Now I am fine with your treatment. I never expect such a sudden relief. Before concluding this I want to thankyou as you are such an extraordinary human being. Thank you once again from my family members. God bless and let the clinic be an example to the world. For the last three years I have been undergoing treatment for my severe back pain issue in various hospitals. But those treatments couldn’t bring relief to my back pain. I couldn’t even fix my leg on to the ground. 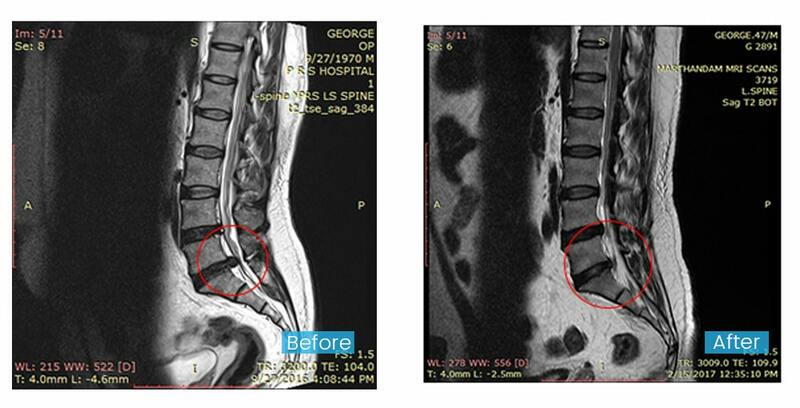 At that time the doctor who treated me informed that there is a bulge in between my disc and due to that dislocation an emergency surgery was needed. But I couldn’t find any financial resources to carry out the surgery. Then through my friends I came to know about Dr. B Robin Guru Singh of Gurupatham Spine Care Centre near Marthandam. I met the doctor and after checking my scanned reports he diagnosed that a nerve supply to my leg is almost stopped. And by a three months treatment without any medication my back pain got cured completely and the credit goes to Dr. B Robin Guru Singh. His kind approach to patients is really appreciable. I am Rosley. I was suffering from severe back pain and couldn't even walk properly. I have to depend on others to go somewhere. That day itself we went to hospital, took scan and confirmed that i was facing severe back pain issues. Doctors told me i must undergo a surgery. I came to know about Gurupatham Spine Care Centre through my friend. I went there consulted Dr.B Robin Guru Singh. He assured me within 2-3 months of treatment I can walk and my spine related problems can be cured easily. I have undergone treatment in the prescribed dates, without any need of operation I can walk now. Thanks to Gurupatham Spine Care Centre. I am Selvam from Kuzhithurai. For the past few years I had pain in my leg, and medications from several hospitals were all in vain. However after a few days of treatment from Gurupatham Spine Care Centre, my leg pain got cured and now I am able to walk without any difficulty. There are many others too who got cured through this treatment. Two years back I was suffering from back pain. I consulted many orthospecialist doctors, who said that it can’t be completely cured even if I had undergone an operation. At that time one of my friend suggested Dr.B Robin Guru Singh’s Gurupatham Spine Care Centre. I consulted him. Doctor informed me that I had three disk complaints, and it can be completely curable with their treatment. Then I was undergone their treatment. Now my back pain is completely cured and I have rejoin my job. I’m basically a Keralite (from Alamcode, Trivandrum), but working in Middle East for the past 20 years. I was having severe neck pain and ended up with numbness on my finger. 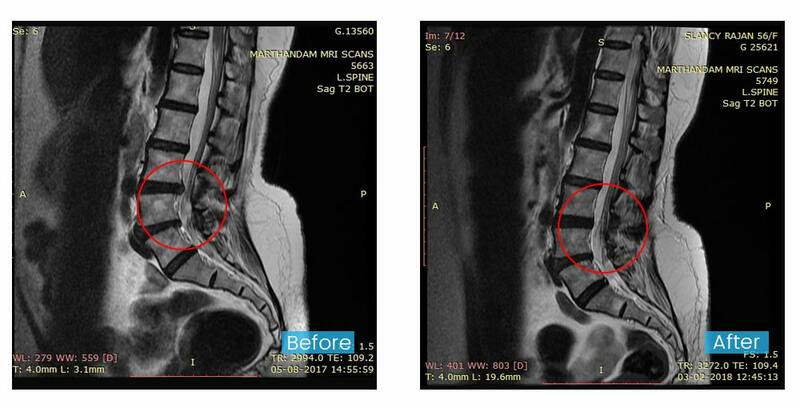 I was diagnosed with disc budging at C2, C3 & C4 and allopathic doctors in Dubai and Kerala advised to proceed with surgery, while 6 months treatment recommended by an Ayurvedic doctor. Later, I came to know the details of Gurupatham Spine Care Center through my friend and approached Dr. Robin Singh during year 2014. Surprisingly, I got relieved of the neck pain after four days of treatment and I managed to go for work after 3 weeks of treatment. With proper rest and care advised by doctor, it took almost 3 to 4 months for a 100% recovery. I wish all the best for the hospital and I am sure their efforts will provide great relief for many patients. Currently, I am having back pain (lumbar issues) and soon will consult with doctor for treatment. I am Ushakumari, suffering from severe back pain. I have visited many doctors but didn't see any improvement in my condition. And even undergone some Ayurvedic treatment which results the same. Then one of my friends told me about Gurupadam Spine Care Centre. I visited Dr.B Robin Guru Singh. With the help of his treatments i recovered soon. Now i can work without seeking help from others. My hearty thanks to Dr.B Robin Guru Singh. My name is Elizabeth L.V from Trivandrum, Kerala.I have recovered from compressive myelopathy by the treatment of Dr.B Robin Guru Singh. I suffered first symptom of this disease on May 15th. I am totally bedridden. Then i came to know about Dr.B Robin Guru Singh (Gurupatham Spine Care Centre) from our Parish Priest whose relatives have done treatment earlier and recovered. Then I decided to take treatment from Gurupatham Spine Care Centre. I got admitted there on August 3rd. After first course of treatment itself, I felt gradual changes. I started eating on my own, moving my legs etc. That time I was fully dependant on wheel chair. After second course i have started walking using walker. When i done my third course I started walking without any help. Now i can walk. I am Kasturi. I was suffering from back pain and leg pain and was receiving treatment from a hospital in Thiruvanmayoor, Chennai. Regardless of the regular treatment it showed no improvement in my health condition. So I decided to move to my native land, Nagercoil. Even here I visited many doctors and everyone insisted me to undergo an operation else I will not be able to walk.Fortunately one of my relatives from Melmidalam referred to Gurupatham Spine Care Centre who was also having the same problem and got completely cured after visiting Gurupatham. Even on the first day of my treatment I got a good result. After subsequent visit in the prescribed dates I got completely cured. I am very happy now. I am Hazeena.H.S ,doing Ph.D in University of Kerala. I reached this hospital when allopathic doctors advised me for a lumbar surgery in 2012 February, with severe back pain, unable even to walk properly. The spine therapy treatment done by Dr.B Robin Guru Singh helped me to recover 70% within first two months and I recovered completely or 100% by six months without any medication , and now happy to lead a pain less peaceful life. Thanks to this institution Gurupatham Spine Care Centre and to Dr.B Robin Guru singh. With my experience ,I am extremely happy to inform and to advice you people, those who are suffering from intense back pain , to undergo spine therapy treatment as an alternative to high dose pain killers which give only temporary relief to the patients. I am a patient of Dr.B Robin Guru singh. for the last 7 years. The treatment is really effective and very good. I was suffering from prolapsed Disc causing severe pain in the spine nerves which also radiates into both legs and lower back as a result it was very difficult to move or walk. For this Orthopedists in Trivandrum suggested immediate surgery but without any problem Dr.B Robin Guru singh. rectified this and brought me back into my normal life. 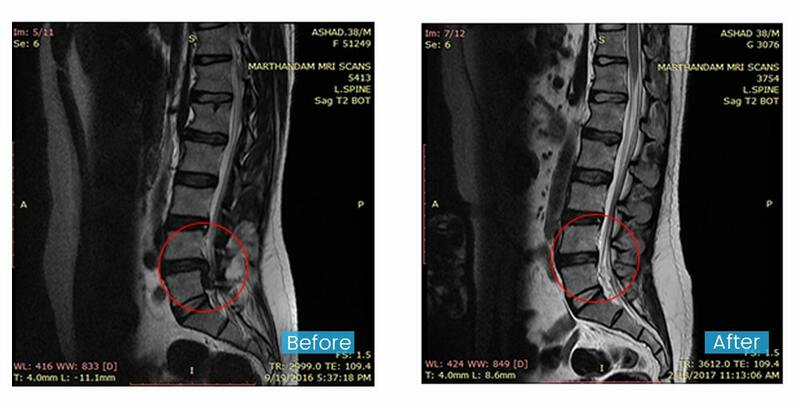 Came to know about Gurupatham Spine Care Centre through my sister's colleague.Her husband had severe back pain which was affecting his career and he was completely cured and leading a normal life. So i decided to consult his physiotherapist for my back pain( inspite of my son being a doctor and my brother in law who is MD in ortho,) when i was bedridden in 2016 Jan. Now i am feeling much better, and doing my house hold chores by myself. Thanks to Almighty God who worked through Dr.B Robin Guru Singh. May God Bless Him and cure many more.